If You paid a visit to Jl. Tirtodipuran, explains you will discover jejeran galeri-galeri selling art goods. But, tries also to step into his(its countrified. Among small gangways, you also able to find goods that is also competent to be made present, that is fan. Located In Mangkuyudan MJ III/215, Jogja, Kipas Seni becomes center fan worker. Fan that is on the market all kinds and is faning with batik cloth cloth material. Besides fan with ordinary form, also there are hat fan. The fan besides applied to dissipate temperature atmosphere, also able to be applied as decoration of wall. Material applied to fan is bamboo wulung as its(the framework and batik cloth. 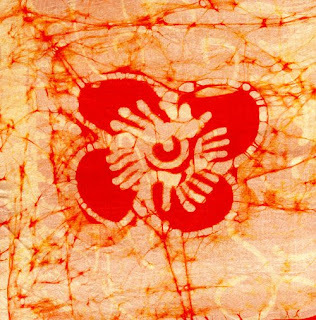 Batik cloth applied by Kipas Seni delivered from Delanggu. While its(the bamboo from worker in Bantul. 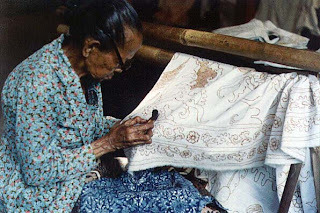 otherwise wish to apply batik cloth, we also able to ask to change its(the cloth material. Ms. Dewi ( 37), owner of Kerajinan Kipas Seni tells that cloth type applied also is adapted for order from buyer. Of course, besides sold and marketed [by] through galeri-galeri and batik shops in Jogja, Kipas Seni also frequently gets order. Tangung-tanggung order do not come from Jakarta, finite of other state like Malaysia, Italia, Dutch and Singapore. But according to Ms. Dewi, the existing finite of Kipas Seni at most sending goods to Kalimantan. Fan that is on the market having immeasurable its(the measure, starts from smallest of the size 15 cm, esteemed Rp biggest finite 1000,- of the size 40 cm is esteemed [by] Rp 45000,-. " We also have ever made fan of the size 1,5 metre, but that is we made only if there are order only," says Diah, one of worker in Kipas Seni. Besides fan as its(the pledge product, Artistic Fan also produces decorative wax;candle, but wax;candle decorated the only produced [by] if there are order only.